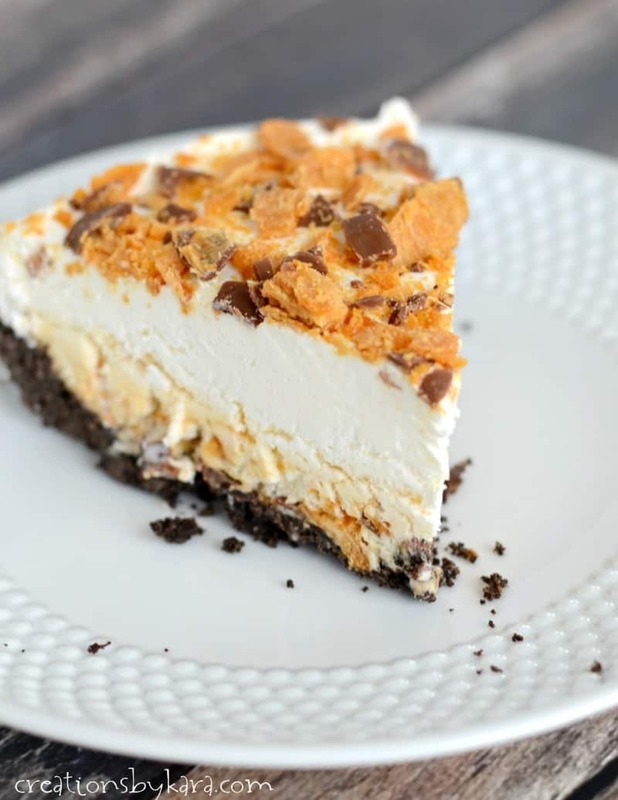 Frozen Butterfinger Pie . 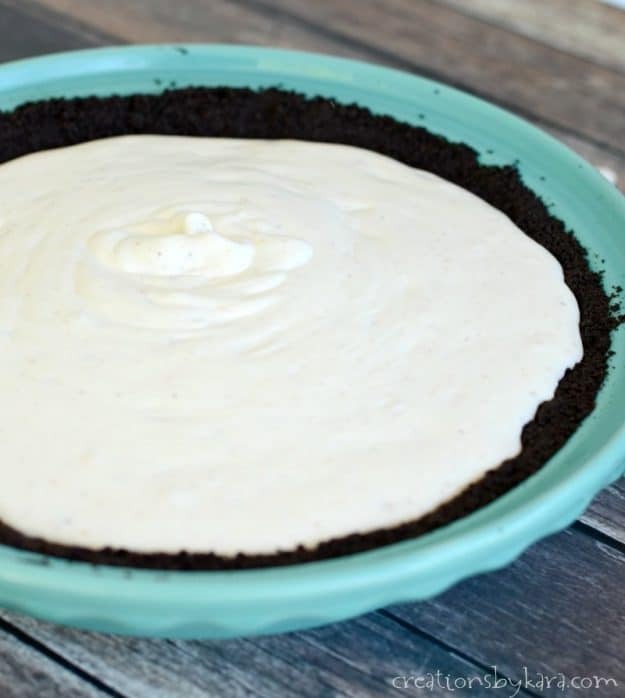 . . every bite of this rich and creamy pie is irresistible! It can be made ahead of time, so it’s perfect for parties. Growing up, I didn’t actually love Butterfingers. But as an adult, I really enjoy them. Especially when they star in a creamy pie like this one! 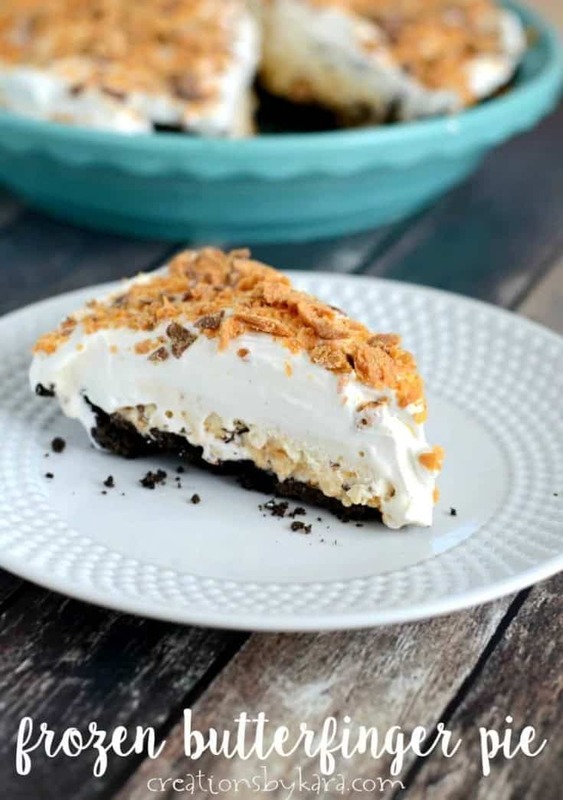 With crushed up Butterfingers in the filling as well as crumbled over the top, this pie is sure to please Butterfinger fans of all ages. Butterfinger pie may look fancy, but it is so easy to make. I started with a made from scratch Oreo crust, but you can use a store bought crust to make the recipe even easier. 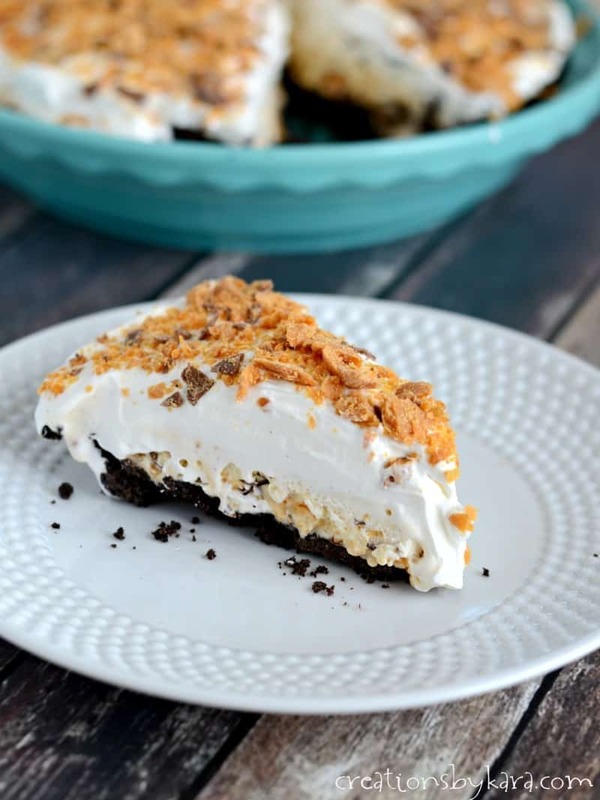 A creamy filling of sweetened condensed milk, whipped cream, and crushed Butterfingers goes into the crust. So simple. After freezing for a few hours, you top the pie with fresh sweetened whipped cream and a liberal sprinkling of chopped Butterfingers. Doesn’t it just look amazing? After you add the whipped cream and Butterfingers, you can serve it one of two ways. You can either serve it as is, with the cream soft and fluffy. Or if you prefer, you can freeze it for another couple of hours till the whole thing is frozen solid. We’ve had it both ways, and they are both mouthwateringly delicious! Every bite of this pie is rich, cool, and creamy. Give it a try and let me know what you think! 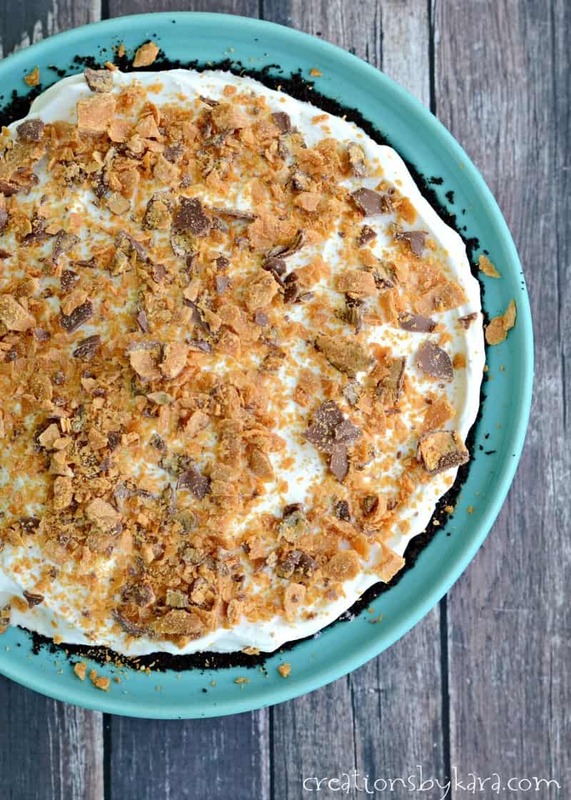 Rich and creamy frozen pie with Butterfinger candy bars. 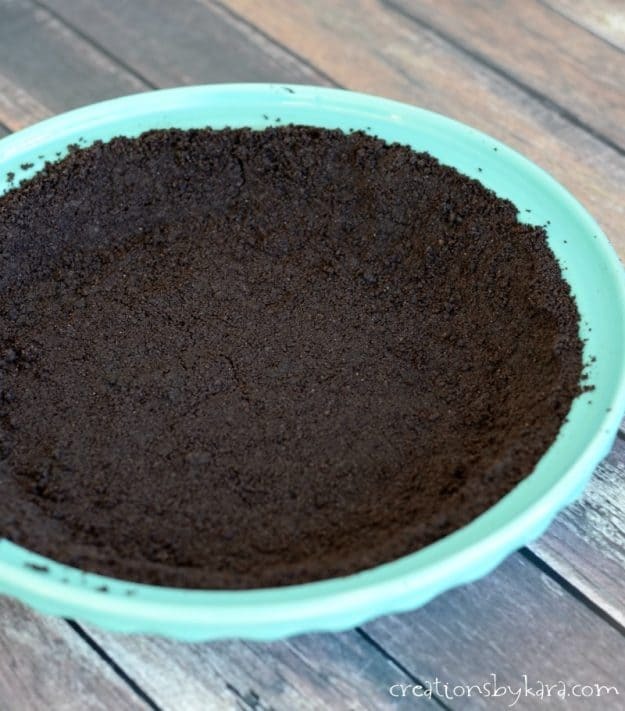 For crust: Combine the Oreo crumbs and melted butter; press into a 9" pie pan. Bake at 375° for 10 minutes. Cool completely. Place in freezer while you prepare the filling. Filling: Beat cream till stiff peaks form. Add sweetened condensed milk and vanilla and beat till smooth. Fold in chopped Butterfingers. Pour filling into the crust and freeze for 4-6 hours. Topping: Beat cream till stiff peaks form. Beat in powdered sugar and vanilla. Spread over frozen pie. Top with the chopped Butterfinger bars. Serve immediately, or freeze for an additional two hours. This recipe was originally shared at Lil' Luna. Well this had me drooling the with every picture! 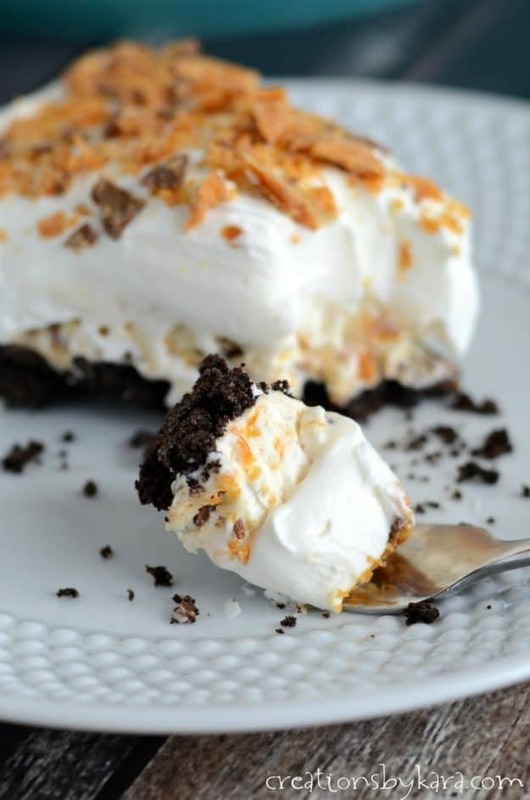 Butterfingers are one of my favorites and this Pie is now one of my favorites! I’m obsessed with butterfingers, this pie is amazing! 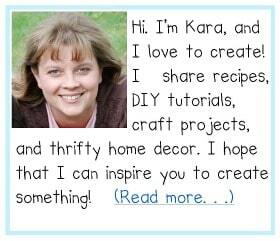 Wow, this does sound like an easy recipe for a delicious dessert. 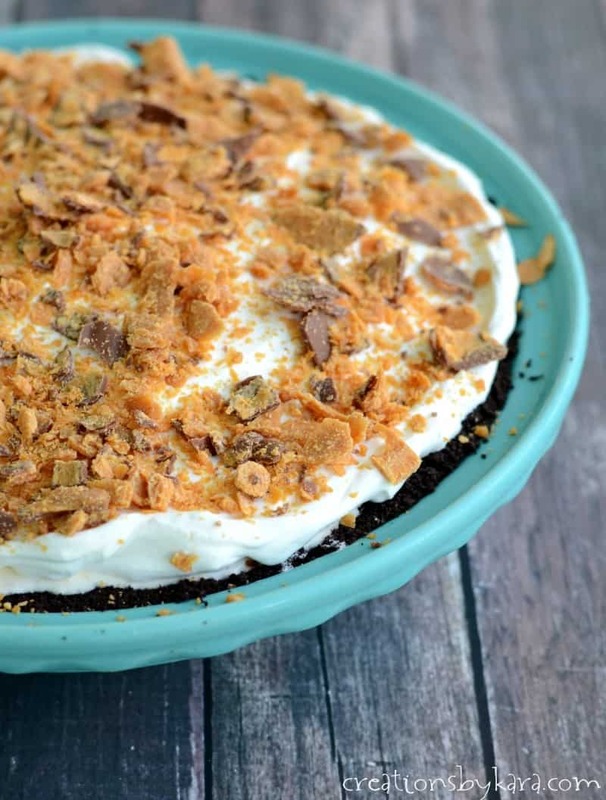 I’ve always loved Butterfinger bars and this looks like a great way to add them to a pie. Perfect timing! My Butterfinger loving daughter will love this for her birthday dessert! !